Talented, creatively gifted Rooster-Pisces is a great dreamer and inventor. It is not interesting for him to exist in the generally accepted framework: he looks at the world a little differently than all the others. He sees beauty in the most ordinary things, and is genuinely surprised if others do not share his enthusiasm. According to the combined horoscope Pisces-Rooster is a gentle, benevolent person, but rather bold in his judgments. He is not afraid to openly express his opinion, he does not hide behind the backs of other people. In this combination the timid Pisces obey the fighting Rooster, become more mobile and self-confident. At the same time they retain their pronounced intuitive flair, the ability to deeply feel everything that is happening around. Benevolent Pisces-Roosters find special pleasure in communication. They easily make new acquaintances, quickly become attached to people. Subtle feel the mood of others — affects the influence of intuitively gifted Pisces. Do not continue to communicate with unpleasant people. They behave modestly, always polite and tactful, and do not obey the majority opinion. Roosters-Pisces are independent in judgments and not as shy as they want to seem. They like to attract attention, dress brightly and brightly. However, the most shocking image can not spoil the general impression: Rooster-Pisces are worthy, respected people. They are able to look elegant and always to the point, but retain their own individuality. The main feature of the Pisces-Rooster sign is a rich imagination. This unusually talented and gifted person exists in his system of coordinates. He sees the true beauty of things, and this amazing gift is not available to everyone. And not just fantasizing and dreaming, but trying to translate their ideas into reality. This business and practical person successfully solves everyday problems, is not lost in difficult situations. After all, soft, charming Pisces-Roosters are in fact not so defenseless: they are able to withstand life’s difficulties. However, it is much easier for people around to recognize these people as eccentrics than to reconcile themselves with their genius. Pisces-Roosters often face envy and misunderstanding, although they are kind and considerate of others. In this combination, the influence of the pragmatic Rooster is clearly traced. It is he who makes the mystic Pisces descend from heaven to earth. It’s not just talented, but financially prosperous people. Not indifferent to money, can not be calm until they reach a certain level of prosperity. Pisces-Roosters — realists, albeit inclined to fantasies. Although sometimes the world of illusions is so enthralling that they forget about their obligations. With age, they become more responsible and collected people. Are pleasant in dialogue, are able to support conversation, but never forget about business. They do not like to waste time in vain, they need stability, so most of the time is devoted to work, not idle talks. Charming Pisces-Roosters can flirt and flirt, they like to attract attention. However, it seems that these sensual, sexual men and women are in no hurry to enter into a close relationship. Dependent on someone else’s opinion, vulnerable and not too confident in themselves, although they try to hide this from others. According to the love horoscope, Pisces-Rooster is a tender, sensitive partner. He avoids obsessive admirers, strives for harmonious relations without quarrels and scandals. Family Pisces-Rooster is not always serious and responsible: sometimes fantasies carry him too far. Although deeply attached to his loved ones, he is afraid of the monotony of married life. Therefore, sometimes he allows himself a little more than that: boredom is his main enemy. At the same time, he is caring and attentive, he strives to provide comfortable life for his relatives. Soft, kind Rooster-Pisces does not like to quarrel, easily makes concessions. Having trusted without measure, which is often used by his relatives. Communicative Pisces-Rooster easily finds a common language with people. You can get along with him if you behave as politely and correctly as possible. This peace-loving person does not like to argue, and criticism deprives him of self-confidence. Quite often, Rooster-Pisces is faced with a misunderstanding of colleagues, as a result: failures and problems at work. However, he finds the strength to move on. Can engage in many activities. The work should enthrall it - this is the main condition, but otherwise no restrictions. 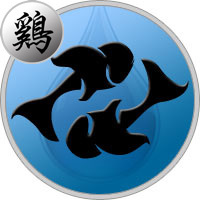 Pisces-Rooster is a creative person, he is not attracted by boring, monotonous work. Although able to become a successful leader, but not too eager for power. Best of all realizes itself in creative professions: an actor, an artist, a director, an art critic. Easily embodies his most fantastic ideas in life. If Rooster-Pisces sees brilliant prospects ahead of him, he will work day and night. This fanatical devotion to the business characterizes him as an enthusiastic, hardworking person. In Pisces-Rooster men feels depth emotionality, these are subtle psychologists endowed with strong intuition. Try not to show real thoughts and emotions, look confident people. Often occupy managerial positions, they are able to organize a profitable business. They try to establish good relations with colleagues and friends. In a love relationship, the Pisces-Rooster are timid, preferring long courtship. He strives to create a strong family, so he hesitates for a long time before making an important decision. Very trusting, naive, often suffers from the betrayal of women, but always with dignity comes out of delicate situations. For women of this combination of signs, there are no problems that could not be solved. For all its fragility, the Pisces-Rooster is a determined woman, able to insist on her own opinion. She prefers equal partnership, so she will not associate her life with a despot and a tyrant. With great enthusiasm she does her favorite thing, and quite successfully. Has the ability to maintain friendly relations even with enemies. Surrounding people appreciate her for kindness. To close people, the Pisces-Rooster woman is very attentive, but she will never allow herself to be governed. She prefers creative men, capable of capturing their ideas, does not tolerate boredom and monotony in the relationship.